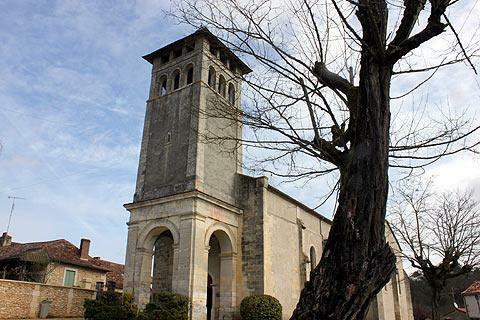 The town of Villamblard is about 20 kilometres north of Bergerac. 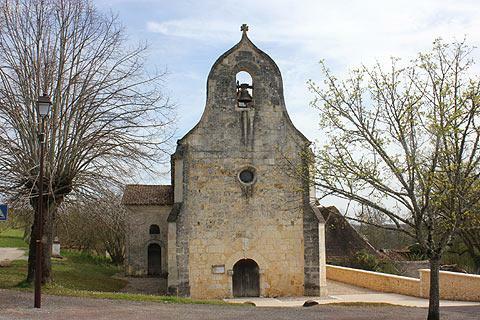 It is a small and pleasant traditional French town that doesn't take long to explore, and is slightly removed from the more famous sights of the Dordogne department, but has a few historical buildings of interest and a visit is pleasant when you are in the region - although the surrounding countryside and villages are the main attraction! 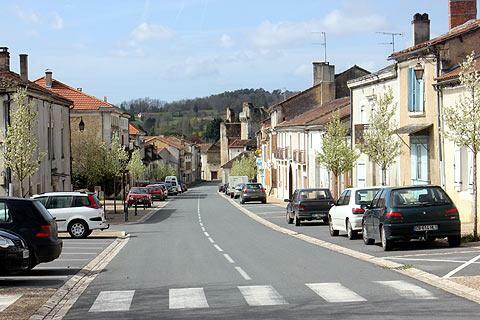 The town centre of Villamblard follows along the length of a broad boulevard that runs from one end of the town to another so there is little chance to get lost! There is also a narrower road parallel to this main road which has a few shops, the two roads being connected by various small streets and squares. 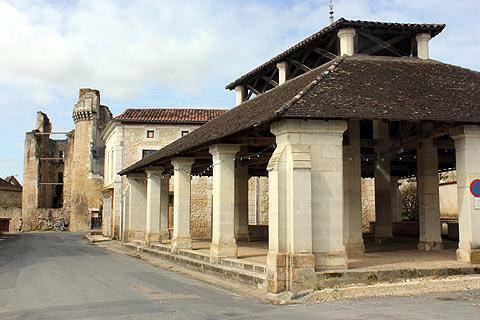 At the highest end of the main street you can see the Church of Saint-Pierre-es-Liens, dating from the 18th century although substantially rebuilt in the 19th century, including the main belltower. 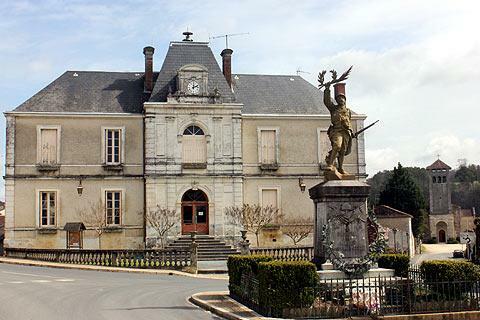 Close to here, and with a view along the whole length of the main street, is Villamblard Town Hall with the War Memorial in front. 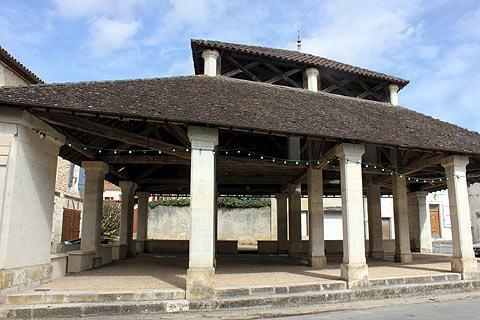 Stroll down the main street, and towards the bottom of the hill you will reach the market hall, a traditional hall of the region with stone columns supporting the roof, but with the more unusual characteristic that the roof is then divided into two parts, the central part raised on smaller stone columns above the other part. 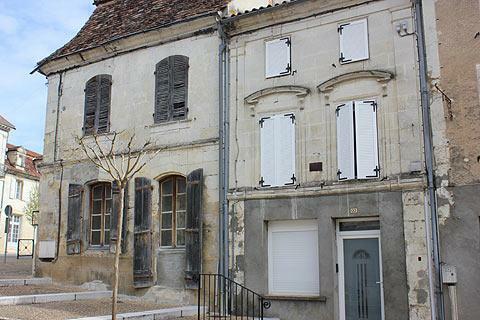 A stone's throw from the market hall is Villamblard castle - the Chateau de Barriere - although the castle now in ruins. The castle has its origins in the 12th century when a tower was built here to look out across the valley below, with substantial alterations made until the 15th century. Over subsequent centuries the castle fell into disrepair, a condition made worse by a fire in the 19th century, and we can now only see the tower and part of the castle living accommodation. Elsewhere in the centre of Villamblard you will find a few small shops and two or three cafes. Curiously there seemed to be several shops that were not just closed but appeared to have been closed for about 50 years, adding to the charm and leaving Villamblard ready to fall back into a timewarp! Beleymas, a hamlet to the south-west of Villamblard with little more than a church and a few houses but in a very picturesque setting so worth the trip. 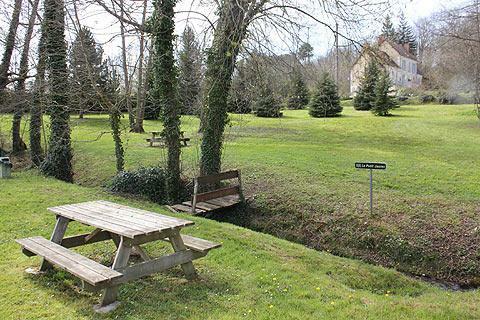 Jaure, to the north, has a pleasant picnic site next to a stream, a roman style church and a small castle in the centre of the village (closed to the public but you can look at it from the gates!) There is also a small water source in the centre of the village, which isn't very exciting to look at (it has been relocated from its original location) but has an interesting history - in the Middle Ages Jaure was an important destination for pilgrims because these waters had the special property of being able to cure sick children, and as recently as the 20th century it is said that a child recovered their voice after trying the waters. Beauregard-et-Bassac, to the east of Villamblard. 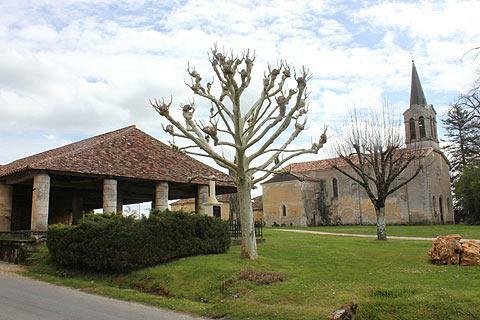 This was the most surprising of the hamlets we explored, with its very picturesque centre including a church, a traditional market hall, a row of cottages and a small chateau around a nicely maintained grassy area.